Have you got what it takes?‘ is a unique workshop that explores how you compare against the key attributes that make for successful intrapreneurs or entirepreneurs. These are those incredible, transformative, versatile individuals who successfully combine the skill sets of entrepreneur, manager and leader to build and develop outstanding organisations in today’s complex business world called the New Normal. Appreciate the implications of the New Normal business world. Explore the concept of intrapreneurship, in other words the entire-preneur. Self-score yourself against the proven key attributes of Talent, Temperament, Technique and Discernment, that are proven attributes to getting things done. Plan your own appropriate future development, understanding why. How balanced is your hand? Can you find these attributes in a colleague? Can you build and improve your hand? Do you care enough to do it? 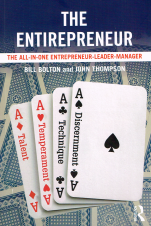 As this is a special launch event for this new joint venture, all participants will also receive a signed copy from John of his book ‘The Entirepreneur.’ They will also be entitled to a £100 discount off the next ‘21st Century Leaders‘ course, should they decide to take their personal career development to the next level. Breakfast and networking is at 8.30 prior to the workshop commencing at 9.00 a.m.